Marico Innovation Foundation, the CSR arm of Marico Limited, works towards nurturing innovation in India. 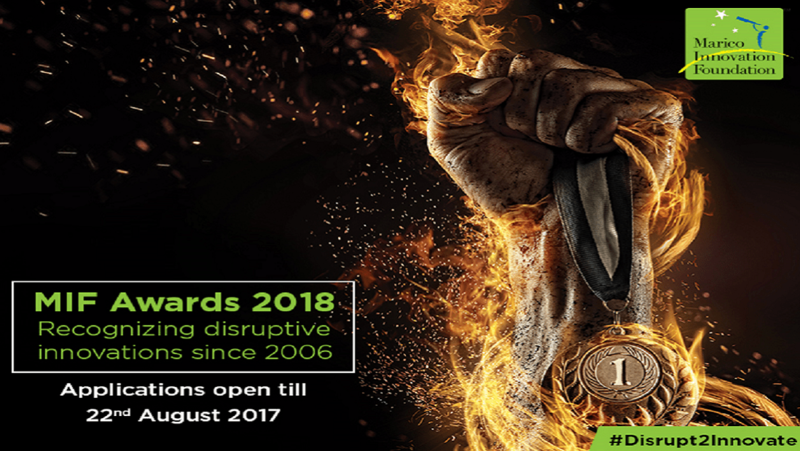 Started in the year 2006, this platform identifies and awards innovations that hold potential to generate large scale impact. Innovations are recognized under two categories – Social Impact and Business Impact. In 2018, MIF is introducing a new category- Innovations by Start-Ups- a first of its kind to encourage newer enterprises to innovate. The process of selecting the list of the final few to be accoladed is a robust one- with a meticulous outreach and two rounds of juries. Applications are welcomed after an exhaustive outreach program. These applications are shortlisted by two juries (one for social impact and another for the business category), comprised of an eclectic mix of subject matter experts. The shortlist is then further scrutinized by the Awards knowledge partner who will complete their due diligence of on-ground immersion, interviews with the CEO and management, the commercial viability of the innovation and impact generated. This research is used in the second Jury round to deliberate the final awardees that will be showcased at the event. What’s in it for the awardees? The takeaway for the awardees transcends beyond the transactional value of material things. Media coverage: Over the previous editions MIF Innovation Awards has recognized more than 50 innovations and the event has received ample coverage by the likes of Forbes, Business Standard, Free Press journal, Impact Magazine, to name a few. Networking with the elite: After an interesting session of awards presentation on the event day, the winners get a chance to rub shoulders with the who’s who in the industry to enhance their network and garner support for their innovation. Art of executive presence: In the 2016 edition, the awardees were trained by the charismatic Coach Vikram on how to present their stories in a manner that captures attention and makes a memorable impact.